Mesenchymal stem cells (MSCs) have vast potential in cell therapy, and are experimentally used in the clinic. Therefore, it is critical to find a serum- and xeno-free cryopreservation method. The aim of this study was to compare two serum- and xeno-free cryoprotectants for MSCs. Adipose tissue MSCs (Ad-MSCs) and bone marrow MSCs (BM-MSCs) were cryopreserved in two cryoprotectants: the defined serum- and xeno-free STEM-CELLBANKER™ (CB) and 10 % dimethyl sulfoxide (DMSO) in a xeno-free serum replacement cell culture medium and compared to non-cryopreserved MSCs. MSCs cryopreserved in CB or DMSO had similar morphology and surface marker expression compared to their respective non-cryopreserved MSC. Ad-MSCs and BM-MSC in both cryoprotectant media exhibited reduced mean fluorescence intensity (MFI) for CD105, BM-MSCs for CD73 and Ad-MSC increased MFI for HLA class I compared to non-cryopreserved MSCs. Population doubling time of CB cryopreserved and non-cryopreserved Ad-MSCs was similar (38.1 ± 13.6 and 36.8 ± 12.1 h), but somewhat higher when cryopreserved in DMSO (42.2 ± 10.8 h). BM-MSCs had higher population doubling time (CB 47.7 ± 11.4 and DMSO 62.3 ± 32.9 h respectively, p < 0.05) compared to Ad-MSCs. The viability of Ad-MSCs was significantly higher after cryopreservation in CB compared to DMSO (90.4 ± 4.5 % vs. 79.9 ± 3.8 % respectively). Ad-MSCs and BM-MSCs retained their mesodermal differentiation potential when cryopreserved in both cryoprotectants. 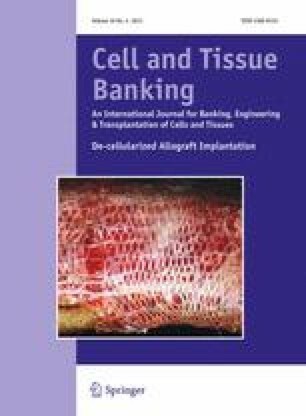 The characteristics of Ad-MSCs post-thawing are better preserved by CB than by DMSO in serum- and xeno-free medium. Furthermore, Ad-MSCs and BM-MSCs are differently affected by the cryoprotectants, which may have implications for cell therapy. A correction to this article is available online at https://doi.org/10.1007/s10561-019-09752-z. This study has been supported by Karolinska Institutet foundation. We thank ZENOAQ for supplying the CB and CELLOTION media.